So once you find such a company at a great price and purchase a partial ownership interest, how long should you hold it? So why not tap into the wisdom of the world?s most celebrated investor? Now, does that mean you should hold every investment forever? But it does mean the ideal holding period is forever. Because most people want to do something, and "something" means buy something or sell something - anything but wait around! But remember, a common stock investment is a partial ownership interest in a real business. So ask yourself, does it really make sense to buy a real business and sell it a day later? How about buying a business, selling it six months later, and then buying it back two months after that? You wouldn't continually buy and sell the corner laundromat, would you? Yet, this is how 95% of investors routinely deal with stocks. They just can't sit still. But the stock market, like the actual business world, rewards patience, diligence, and wise long-term decisions. Not only does this rule force you to make better decisions (after all, you wouldn't invest in a bad business for the long-term, would you? ), but it also takes advantage of the superior annual compounding rates of return offered by your great business. You want your great business to work on your behalf for a long, long time. Hopefully, for the rest of your life. If you've discovered the goose that lays the golden egg, why sell it off for a quick 20%, 50%, or even 100% gain? If you sell your ownership interest in a great company, what do you do with the proceeds? Invest in another great business? Great businesses are hard to find, and it takes a lot of patience and research to find one and purchase it at the right price. If you purchase a great company at a great price, then you'll enjoy above average investment returns for as long as the company continues to be great. Knowing this, only an earth-shattering event should ever make you sell a great investment. After all, how many great investment ideas can you have? Great financial returns don't grow on trees. And let me tell you, once you've gathered enough experience investing in great companies trading at great prices, you'll soon learn that more often than not, the best investment for today is to purchase a larger share of the great business you purchased just yesterday. In "Roth IRA Investing," I point out that the key to a successful Roth IRA (regardless of investment choice) is keeping a lid on your costs. Frequent trading is one surefire way to hammer your returns. After all, federal law limits your annual contribution to anywhere between $5,000 and $6,000. If you're constantly buying and selling stocks, you can eat up a good portion of your annual contribution with trading fees, even when using online discount brokers who offer historically low transaction fees. But regardless of fees, it just doesn't make sense to constantly buy and sell great businesses. You want them working for you, so the value of your portfolio can grow in tandem with their earnings. It's such a simple idea... Buy great companies at great prices. But it's extremely difficult for most investors. And the Internet makes it even more difficult, because you can sit and watch real time price quotes of your investment every second the market is open. With second-by-second price quotes, a few months seems like forever! You'll find yourself pulling your hair out because your portfolio hasn't moved up on a daily basis... Why hasn't it gone up 12,000% in three months? Why? Why! So don't be seduced into "watching the grass grow." If you try to watch grass grow, it won't. And don't fall for the notion that you need to "do something" or "restructure your portfolio." How can you be so sure everything will be fine in the long-run? Because history tells you so. You can buy great companies at great prices, then just sit around and do nothing, and you'll experience some of the best investment returns in history. Extraordinary market beating returns are available to anyone with the patience and discipline necessary to achieve them. In his book "The Future for Investors," Jeremy Siegel identifies a number of companies which he labels "Corporate El Dorados." Why does he call them corporate El Dorados? What's most interesting about these corporate El Dorados is the overwhelming majority of them offer products or services that just about every citizen in the industrialized world can readily identify. In other words, these companies aren't a secret. They operate right out in the open for everyone to see. You don't have to scan hundreds of investment newsletters or hope and pray for a "hot stock tip" to uncover the names of these great companies. Yet, most investors willingly ignore these corporate El Dorados in favor of chasing "can't miss stocks" and the latest hot stock tips. 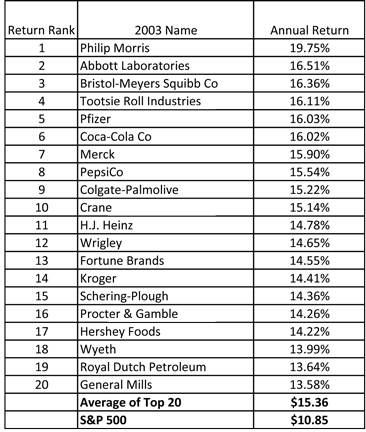 It lists the top 20 best performing firms from the original S&P 500 index created in 1957. History shows each of these great companies beat the market by a substantial margin over the course of several decades. In other words, by simply purchasing these great companies at average prices and reinvesting the dividends, you could have put your investment portfolio on autopilot for the past fifty years and still trounced the market! Those are some impressive stock returns, aren't they? Recognize any of the names? But I guarantee you know the names of most of the products created by every single one of these companies. And here's the kicker, investors in 1957 also knew the names of the products created by these corporate El Dorados. Even though each of these companies grew substantially between 1957 and 2003, not one was a small, obscure company in 1957. After all, they were in the S&P 500, so they were diligently followed by Wall Street analysts and widely recognized as industry leaders! So the data reveals that even if you purchase a great company at an average price instead of a great price, it's still possible to beat the market average. So keep hammering that idea into your head. Buy great companies at great prices, and you'll do great in the long-term? So now that you're thoroughly convinced to purchase investments for the long-term, you still need to know one more piece of valuable information before you're able to buy a great company at a great price. What's that last piece of valuable information? It's one of the primary reasons their investment decisions never work out the way they envision.